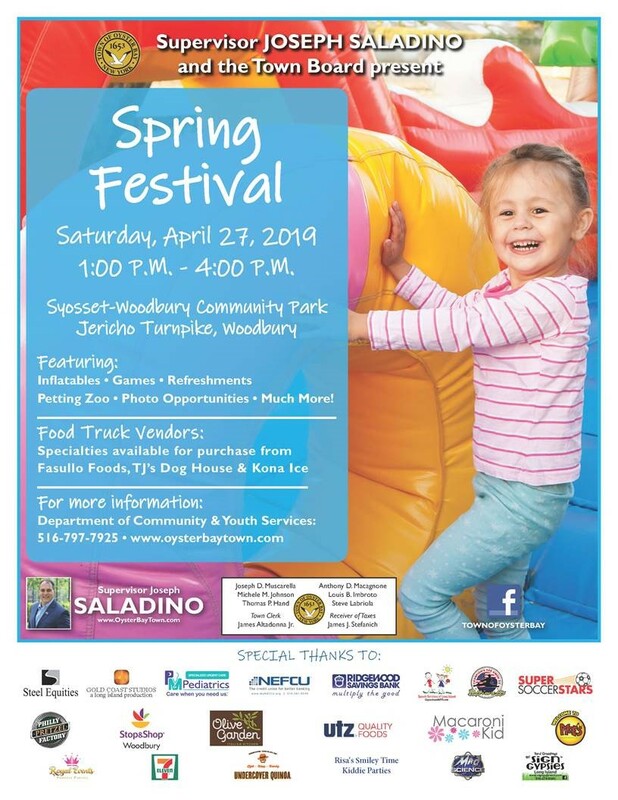 Oyster Bay Town Supervisor Joseph Saladino invites residents and their families to a Spring Festival on Saturday, April 27th from 1 p.m. to 4 p.m. at Syosset-Woodbury Community Park, located on Jericho Turnpike in Woodbury. The Spring Festival will be held rain or shine. The Spring Festival will feature inflatables, games, refreshments, a petting zoo, multiple photo opportunities and so much more! Additionally, food truck vendors will be on hand for the event, offering specialty foods available for purchase from some big names, like Fasullo Foods, Kona Ice and TJ’s Dog House. “This free event is one of the most popular in our Town, and a great opportunity for residents to enjoy our park and celebrate the arrival of spring with a full afternoon of activities, games and attractions that are sure to entertain children and adults alike,” said Supervisor Saladino. The event hosted by the Town of Oyster Bay Department of Community & Youth Services. A special thanks to the following event sponsors: Steel Equities, Gold Coast Studios, PM Pediatrics, NEFCU, Ridgewood Savings Bank, Long Island Center For Speech, Ultimate Champions Tae Kwon Do, Super Soccer Stars, Philly Pretzel Factory of Syosset, Stop and Shop of Woodbury, Olive Garden, UTZ Quality Foods, Macaroni Kid, Moe’s Southwest Grill, Royal Events Princess Parties, 7-Eleven, Undercover Quinoa, Risa’s Smiley Time Kiddie Parties, Mad Science of Long Island, and Yard Greetings by Sign Gypsies.